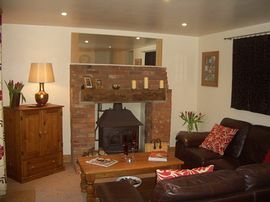 The cottage is an excellent country retreat, set within the private gated grounds of our own property Barnsdale House, you are welcomed in to the cottage through the pretty court yard entrance and provided with plenty of space in your own secluded rear garden to relax under the gazebo and eat on the decking. Newly refurbished to a high standard the cottage includes, one double bedroom, shower room, lounge and dinning area and a newly fitted kitchen and appliances. 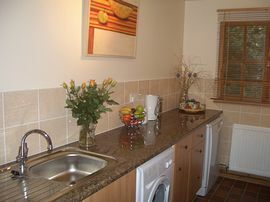 The well equipped kitchen provides for all guest needs and includes dishwasher, washing machine, oven and microwave. In addition, Tassimo and espresso, coffee machines and electric steamer are provided for guest's convenience. For a full facilities list please see the tariff page on our website. In the shade of the hedgerows outside eating is a pleasure, walking through the French doors from the lounge guests will find comfortable garden furniture, a gas Barbeque and lighting all provided under the adjoining gazebo. 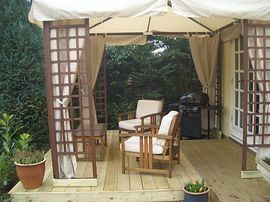 Making enjoying summer evenings on the private decked area easy! Ample parking is provided for guests at the front of the property, behind private gates. For cooler evenings, the Lounge is warmed by a traditional log burner (logs provided) and provides all the usual home comforts for a cosy night in. A TV (freeview), DVD, and CD player with a variety of music, films, and wide selection of books are available for guest’s enjoyment. Guests are invited to relax in the newly fitted Hot Tub and enjoy the garden both day and evening. Owls and Pheasants are frequent visitors and this is superb for soaking up bird song on warm summer evenings. (A minimal weekly charge, robes & towels are provided but guests will need their own swim wear) To enhance your stay at Barnsdale, we are also pleased to offer additional options including; home cooked meals on your night of arrival/departure (please ask for menu options when booking) and to celebrate special occasions, champagne and chocolates or champagne and flowers on arrival. 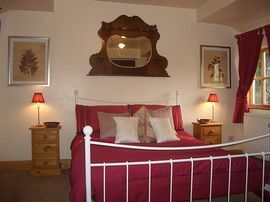 New Fully Refurbished Luxury Accomodation. M11, to Stansted Airport - join the A130 to Braintree - Take the A131 towards Sudbury and follow signs to Bocking and latterly Shalford. Arrive Stansted Airport, The cottage is 10 miles away - Take the A130 to Braintree - Take the A131 towards Sudbury and follow signs to Bocking and latterly Shalford. From London Liverpool Street, Straight through on the Eastern Line (Ipswich) to Braintree Town or Freeport Stations. The bus depot is opposite; take the No 9 to Shalford (5 miles) the bus stop is immediately outside the George Inn, 100 yards from the cottage. 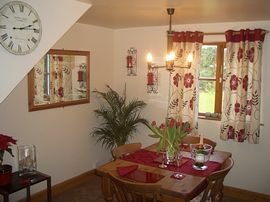 Short Breaks: From £120.00 two nights. Look out for Special Mid Week and Weekend Offers. Saturday to Saturday - Wednesday to Wednesday - Monday to Friday - Friday to Sunday on availability.